My favorite food in the entire world is caramelized onions. They are the perfect combination of sweet and savory and when done correctly make a dish a million times better. When I was first getting into cooking in high school, I used to make this salad almost every single day with spinach leaves, cucumbers, avocado and a touch of peanut sauce and then top it with a smattering of caramelized onions. When I finally got a kitchen of my own in college, I would make egg white omelets that started with caramelized onions almost every single day. If I'm out to eat and there are caramelized onions on a dish, you know that's what I'm going to order. It is neither socially acceptable nor the basis for a well balanced diet to only eat caramelized onions. Now, I incorporate them in tarts, pizzas, and anything else I can shove 'em in. When I'm feeling fancy I pick up a bottle of red (maybe a bottle of white?) and a baguette and make myself a big pot of french onion soup. I've even shared my recipe with you on the blog. Any time I am dreaming up a recipe or am inspired by something I see or read, there is always a little voice in the back of my head asking "Can this be made better with caramelized onions?" Last Sunday was no different. I woke up feeling like I could take on the world and wanted to run every single errand before noon so I could cook all afternoon. I biked down to my favorite Trader Joe's (to be replaced by the U street TJ's in March! ), picked up what I couldn't get there at two other places, and got home in time to force Lisa to go to breakfast with me at our favorite French Bakery. The just-baked baguettes were calling to me, begging to for some french onion… jam? 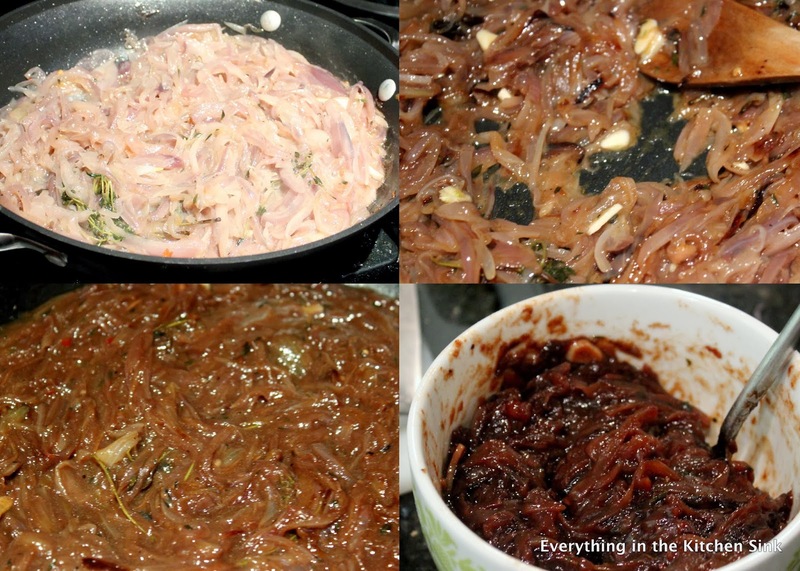 Yes, french onion jam! I did everything I would do to start a french onion soup from cooking the onions low and slow for almost two hours (patience is a virtue), deglazing with red wine, simmering with a little bit of stock to get the flavor of long-cooked soup, and reducing to make the most luscious onion jam I've ever had in my life. This whole process will take you about 1 1/2 to 2 hours, but I refuse to give you exact times. Keep the heat low, stay semi-close to the stove (I would check every 5-10 minutes), and trust your gut! I used the jam in a sort of reconstructed french onion soup sandwich. Sections of baguette were sliced for sandwiches, slathered with the jam while still hot, covered with thinly sliced gruyere cheese, and topped with a little bit of a baby arugula lettuce mix for some bite. It could also work at a crostini for a party, like I tried below. For an extra special touch, you could throw it under the broiler like you do the soup to get the cheese nice and bubbly. It was a fun and lazy Sunday cooking project that left an almost full bottle wine to be enjoyed with the French Onion Jam sandwiches. And I am not ashamed to admit that I ate the jam on almost everything for the rest of the week. Judge me. In a large pan over low heat, add the bacon fat (or butter) and melt. Add the thinly sliced red and yellow onion and the sprigs of thyme. Season with salt and pepper. Cook on low heat. Low and slow will yield the best flavor, avoid browning until the onions want to! When the onions begin to soften and become fully pliable, add the thinly sliced shallots. Continue to cook on low. When the onions and shallots begin to take on some brown color, add the thinly sliced garlic, lemon zest, and crushed red pepper flakes. Continue to cook on low, adding a little butter or olive oil if the pan is looking dry. When the onions have really taken on a brown color, as in when you add balsamic vinegar there is little to no change in color, add the balsamic vinegar. Let reduce, stirring frequently. At this point, add the red wine and deglaze the pan. Add the stock (I used chicken) and raise the heat to medium to slowly bring the onions, wine, and stock to a boil. Reduce back to low, cover the pan, and let simmer for about 10 minutes. Remove the lid, increased the heat back to medium, and cook out the liquid until you have a jam-like consistency. Taste for seasoning, adding salt, pepper, and/or lemon juice (if you think it needs a little acid). Serve up with good french bread and some gruyere cheese. Enjoy! I am terrible at waiting for onions to caramelize, so kudos to you for being patient for a whole TWO HOURS. But, it definitely pays off with this jam! I'd be spreading that all over everything. My husband would absolutely swoon at this recipe. Listen for his tears of happiness!